Can Iconic 'Earthrise' Photo Help Protect Earth from Asteroid Impacts? 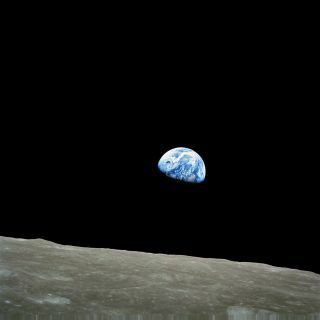 "Earthrise," the first picture taken of planet Earth by people orbiting the moon. This shot was captured by Apollo 8 astronaut Bill Anders on December 24, 1968, as his spacecraft became the first to fly around the moon. The NASA astronaut who snapped the 20th century's most famous photograph of Earth from space hopes the image can continue helping to protect the planet — not just from the depredations of its human inhabitants, but also from incoming space rocks. Apollo 8 crewmember Bill Anders' iconic "Earthrise" photo, taken from lunar orbit on Dec. 24, 1968, helped spark the modern environmental movement, many experts say. It gave people a new perspective on the planet, showing Earth as a tiny and fragile outpost of life hanging alone in the immense blackness of space. "Hopefully, the Earthrise picture, which did help kick off the environmental movement, can also help people appreciate that our planet needs protection from things raining in," Anders told reporters on Earth Day (Tuesday, April 22). Anders was speaking at a press conference held by the nonprofit B612 Foundation, which seeks to predict and prevent devastating asteroid strikes. The Chelyabinsk event occurred without warning, which shouldn't come as much of a surprise. Millions of asteroids cruise through Earth's neck of the cosmic woods, and scientists have identified and tracked less than 11,000 of them to date. The B612 Foundation wants to spot potentially dangerous asteroids far before their potential collisions with Earth, giving humanity a chance to mount a deflection mission. To that end, the organization is building a $250 million space telescope called Sentinel, which will hunt for space rocks in infrared light from a Venus-like orbit. B612 is aiming for a 2018 launch for Sentinel, which should identify perhaps 500,000 near-Earth asteroids over the course of its planned 6.5-year mission, organization representatives have said. "Asteroid impacts are not that rare," Lu said. "The main message we want to get across is that it doesn't have to be this way. We humans can actually go and change this."